A well-lived life is full of big moments. Maybe you’re about to get married to the partner of your dreams? Maybe you have the biggest interview of your career? Or maybe you’re finally about to graduate with that degree you’ve worked so hard for? It’s important for you to look and feel your best. But maybe your pearly whites aren’t so pearly or white anymore and you’re self-conscious about smiling. Maybe your self-esteem needs a boost? If you can relate to all this, professional teeth whitening treatments might be just what you need to smile your best smile! 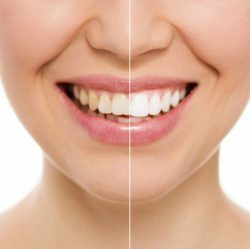 If you are in the Oakton VA area and are considering professional teeth whitening, Dr. Ahrabi and his team at Oakton Dental Center can help. Even if you’ve properly cared for your teeth by brushing and flossing as advised by your dentist, discoloration of your teeth will still occur naturally over time. This process can also be accelerated by other factors such as smoking or chewing tobacco or daily drinking of coffee, tea, cola or red wine. Even certain prescription medications count discoloration of teeth as a side effect. Your dentist suggests brushing twice daily and flossing at least once daily. These measures can slow this discoloration down and help your smile stay brighter and healthier longer. However, it cannot remove the stains. Oakton VA dentist Dr. Ahrabi offers patients the option of in office or take home teeth whitening. Both treatments revitalize your teeth by removing years’ worth of stains and discoloration. A fresh, white smile can boost your self-confidence and make you ready to meet whatever challenge you’re facing. Our method of teeth whitening with the most immediate results is the in-office procedure. This procedure is done in a little over an hour and can produce results up to ten shades lighter. Your results will vary depending on how severe the stains are and their source, with certain stains being more difficult to erase completely. Dr. Ahrabi will discuss expected results prior to your treatment during your consultation. The process of in-office teeth whitening usually proceeds as follows: First, we set up a protective barrier against the bleaching agent for your gums. Next, we brush a layer of that maximum strength bleaching gel onto your teeth. Then, we activate the bleaching ingredients by application of a special light. This process may need to be repeated several times over several months until you achieve your desired shade of whiteness. A more convenient method for whitening your teeth is our at-home whitening kit. This method utilizes custom-fitted trays that Dr. Ahrabi creates in the office using state of the art technology and maximum strength bleaching gel. The take home kit provides far superior results when compared to the over the counter options for sale at your local drugstore such as whitening strips and toothpastes. At home, you will fill the custom-fitted trays with gel and wear them over your teeth for the recommended length of time, usually overnight while you sleep. The bleaching gel- which contains fluoride-will gradually erase stains while also reducing sensitivity and strengthening your enamel. After regular use over the course of several weeks, your teeth will look dramatically whiter. All our teeth whitening products are specially formulated to minimize tooth sensitivity and Dr. Ahrabi carefully supervises teeth whitening treatments. To discuss which teeth whitening treatment would work best for your dental hygiene goals, schedule an appointment with Dr. Ahrabi and his team at Oakton Dental Center in Oakton VA by calling (703) 382-6789 or request an appointment online.